Now there is a crazy idea. Can this behemoth navigate a lagoon or a flat? Absolutely not. But it can take you somewhere close. 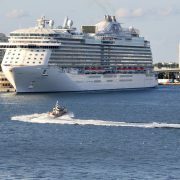 My wife loves the relaxation these cruise trips can provide. No internet and no phone if you so choose and you get away from the treadmill. With the crazy hours she puts in I understand completely and I am willing to provide valuable service as a Sherpa. When this trip was decided I started looking for fly fishing opportunities during the port days. 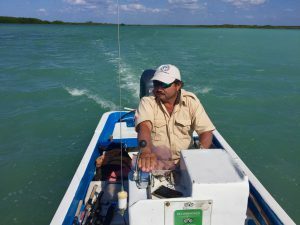 I came across a positive report on Carlos´s Vegas flats fishing operation. The die was cast and the day booked. 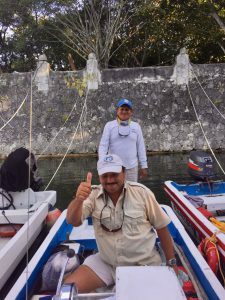 I received all the info I needed from Carlos on which flies to bring and all the minutiae we love in fly fishing. Instruction were clear, be first off ship at 8am, take a taxi to Puerto De Abrigo Banco Playa (20 min) and I did. Meet up with Captain Enrique who is going to guide you and I did that too. The boat we used was a so called Panga boat wth a narrow beam and relatively high bow. Lunch and drinks are included and all was ready. 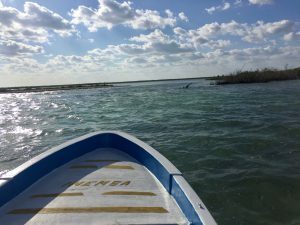 Off we went to Rio de la Plata lagoon. Capt. Enrique drove the boat fast on the open sea and we stayed dry the 40 minutes the drive took. The other boat from the service was clearly trying to beat us to the lagoon and did. It figures it´s Captain Mike, Enrique´s son. 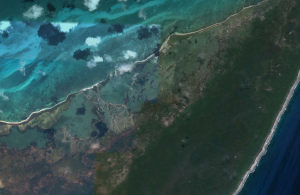 The Lagoon Rio de la Plata is in the top North East corner of Cozumel with the inlet facing west. When I noticed the size of the inlet to the lagoon I did not realize how big it was. The passage was shallow but passable and when inside I realized how wast this lagoon system is. Things were looking pretty good at that time and we went as far north as we could get. When there the wind was steadily picking up and clouds were covering the sky. Only occasional sunshine. 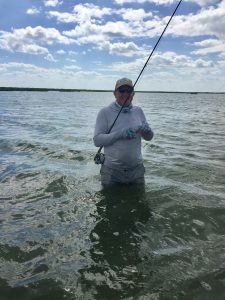 The important fact about Bonefishing is that you have to be able to see the fish to be able to cast to it. That possibility was out because of the clouds. Now it happens that Bonefish sometimes tail. Meaning that they are standing on their heads rooting on the bottom and their tails can be seen above the surface. That was our best bet and the boat was left at anchor and we went searching for tailing reds but alas none were found. We were walking for hours in water to our waists. This situation is a nightmare for a guide. His job is to find the fish and my job is to catch them. These circumstances were very tough for Capt. Enrique but I knew that and I know that the guides are not the Gods of the Weather. As it happened Capt. Enrique suddenly stopped and indicated that I should cast over a certain area. 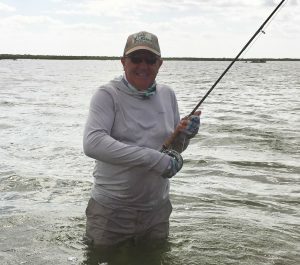 Of course I got some hits and landed 2 Bonefish on Moana´s Chili Pepper Gold #6. How he knew there were fish there was not clear to me. In the end we both did our jobs and I was very pleased. We were far from the boat in water to our waists and it is not recommended to carry cameras when doing that. 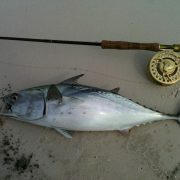 I can not produce any pictures to prove my catch but when does a fisherman lie? 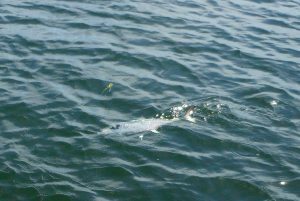 That was that and we tried for some Snook on our return without success. After returning to the marina I shared a Taxi with a young couple starting out in this fly fishing madness. “How did it go”? they asked. “Well I managed to land two Bones (now I pretend I am an old hand at it) wading all day”. “how did you do”? They saw some life but did not catch any fish and “No no no we did not leave the boat. Didn’t you see the crocs”? 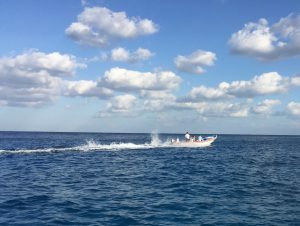 Next time in Cozumel I am certain that I will be found in the lagoon chasing Bonefish guided by Capt. Enrique. (The Crocs in Cozumel are not aggressive to humans. Found only one incident of a croc biting a human when searching the internet). https://everyjonahhasawhale.com/wp-content/uploads/2016/11/IMG_6007.jpg 3168 4752 Jonas Magnusson https://everyjonahhasawhale.com/wp-content/uploads/2019/03/FFI_9846_Logo®_Casting_Instructor_CMYK-600x476.jpg Jonas Magnusson2016-11-25 14:29:112017-05-03 13:31:13Cruise ship fly fishing!?!? Around half a million people live in Escambia county and Santa Rosa county according to the 2010 census. These counties pride themselves on their beaches and they should. However scarcely few have a clue on what is IN the water and can be witnessed by just walking the beach and observing. 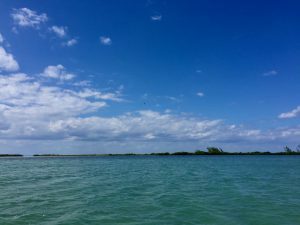 Countless species of fish, sharks and dolphins the occasional Manatee and diverse birds working can be observed and enjoyed as one marvels at the diversity of nature. 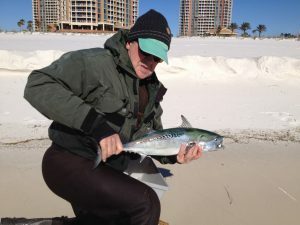 During the so-called winter here in Panhandle area the fishing can be just fabulous. What gets my juices flowing is a northerly wind. I particularly like the second day of a northerly. 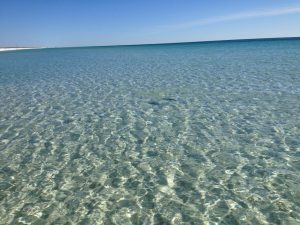 The first day can have some residual wave action but on the second day the Gulf is just flat and the water clear and it is just breathtaking – but I digress. What I am looking for is the False Albacore. 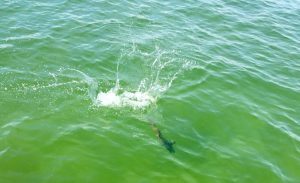 When the heavenly bodies are aligned and the Gulf is flat it sometimes happens that the Albacore come cruising up and down the beach. 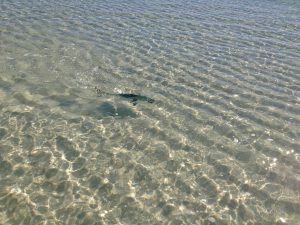 It is astonishing to see these fish in the first trough in very shallow water. They can be cruising outside the first sandbar too and easily spotted. The first time I witnessed this spectacle I must admit that some sphincters loosened a bit and I bunged the casts utterly. With increasing sophistication the sphincters were tamed and the cast was resurrected. Jonas getting ready to release a False Albacore – note beanie on top of cap – fashionista! The fly I have been successful with is the Gummy Minnow #4. If the Albacore take the fly you are in for a stupendous ride (it is rumored that they can go 40 mph). 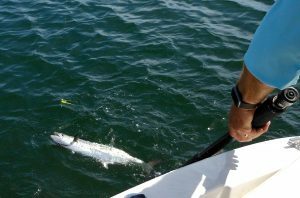 They will just run for open water and the reel will be screaming far into the backing. Keep your fingers from the rotating reel handle if you want unbroken fingers. It is just fascinating the speed of these runs. Usually they will take you far into the backing and manage 2 such runs so do not think they are done after one. We happened to be there on the beach in one early January and we were honored by their presence. It was just one of these moments in your angling life that probably never will never be repeated so whenever it happens take great care to savor that moment. We had constant action for 2-3 hours and this memory is forever seared onto the hard drives of our minds. While you are at it you might also thank the piscatorial goddess that reigns over such matters. The Monarchs are getting ready to haul off to Mexico. It is that season. These creatures are worthy of our respect and admiration. 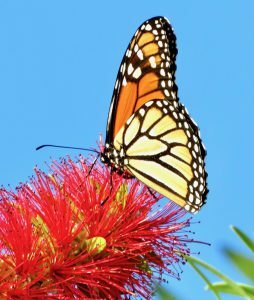 This one fueling up on nectar from my Bottlebrush is the forth generation of this year. 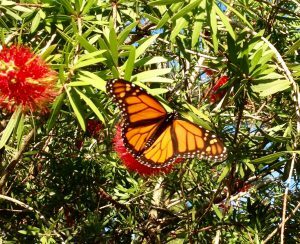 This Monarch is destined to fly from the Florida Panhandle to Mexico for the winter. 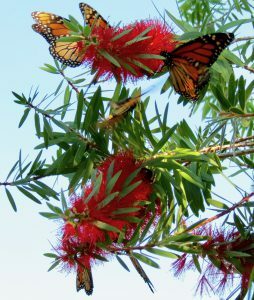 I am not any authority on Butterflies but witnessing this spectacle when they cover my Bottlebrush trees has led me to Google a bit. 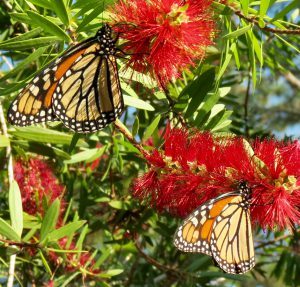 If you would witness the “gathering” on my Bottlebrush trees and not be moved you are probably dead. I simple must share this with my friends. It is impossible for me to get a picture that conveys the sheer number on my trees. These two above is just to give an idea of the density of the Monarchs. You will have to believe me when I tell you that there are thousands working and drinking the nectar that fuels them. 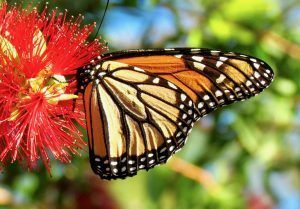 The forth generation of Monarchs will reach Mexico for the winter. I have not witnessed the winter location but pictures on the web are telling. There are some that will spend the winter in south Florida and they migrate down the peninsula in the fall. Then there are others that take the coast route to Mexico and pass through here in the Panhandle. These Monarchs are the ones that roam east of the Appalachians. 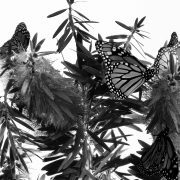 Monarchs west of the Sierras can overwinter in San Joaquin Valley. Those in between migrate to Mexico (or this is how I have understood it). If I am getting it wrong please post a reply to me so I can correct this blog. 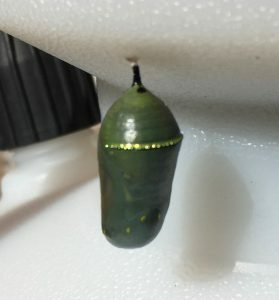 The Monarch Chrysalis is attached to a Round-Up plastic container! They are beautiful but not smart. Now the great miracle of metamorphosis occurs and the butterfly emerges from the Chrysalis. And – no the shower that fishermen take after a days work is not comparable albeit a small miracle. This first generation Monarchs will fly north. There will be the second and the third generation as they fly and actually reach Canada. These generations all are completely reliant on Milkweed plants. The Caterpillars will only chomp on those. 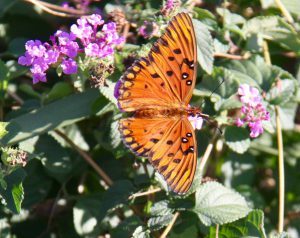 The fourth generation is responsible for getting back to the winter-grounds and they do not need any Milkweed until after mating next spring. This generation must get nectar for the flight. The Bottlebrush trees are a great attractor and the Hummingbirds also love them but most of the Hummers are gone south by now. 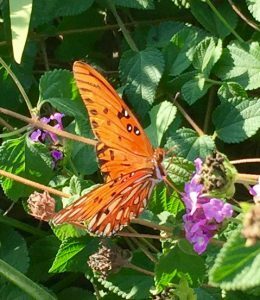 These colors of the Monarchs are there for a reason. This is called true advertising. “I am black and orange and you eat me at your peril” – they are poisonous because of the Cardenolides. 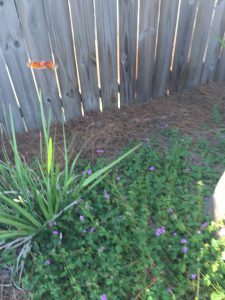 In my garden I also find the Gulf Fritillary. And we notice right away that they are sporting the same colors. However they are not poisonous. This ploy they use and is called false advertising. They are sheep in wolves garb. I prefer sheep in sheep´s clothes. The bad hombre stunt is already taken so I had to improvise. 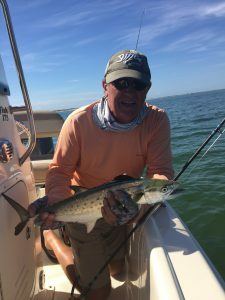 I love catching Spanish Mackerel. There it is an admission and we can move on. 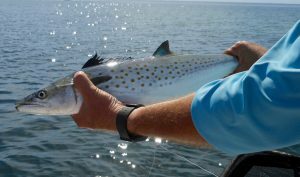 The Spanish appear in the spring on our Gulf shores and then they make their way into the bay systems. The water temperature needs to be 68-70F and over. What I find exciting about them are the ferocious takes. There is no nibbling or sipping or such cautious stuff they mean business and the fly gets hammered. Their teeth are sharp and cutting. They easily cut through 40 pound even 60 pound strain tippets. 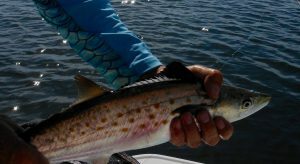 They announce their return in the spring by hammering your redfish fly and cut it off. The leader is frayed not with the curlicue end (pig tail) the tell tale of a sloppy tying of fly to a leader. I used to use thick tippet for the terminal connection but I have subsequently moved to nylon coated multi strand wire. It is easier to tie and withstands the mayhem. Of course the coating takes a beating but the wires hold. It is generally a good idea to inspect the wire to fly connection and move the fly up by retying if the tippet has gotten a beating. 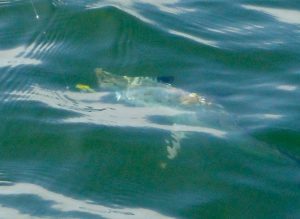 The tube flies are remarkable in that after the fish is hooked they ride up the leader and are more durable than the classical flies. However after catching a number of fish they manage to destroy them all the same. They usually move in schools small or large. If you catch one there are probably many more right there. These are aggressive fish and if you can locate them they usually take a fly. However “always” is a dangerous word and they can follow right up to the boat but then turn away or hammer the fly feet from the boat. This brings me to a general advice. 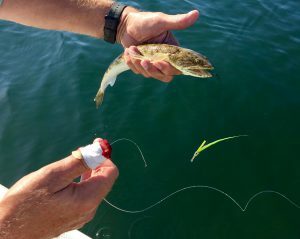 When anglers strip the fly towards them I notice that sometimes they start recasting when there is say 20 feet to the boat. They do this to avoid all that false casting when only a short line is outside the tiptop. 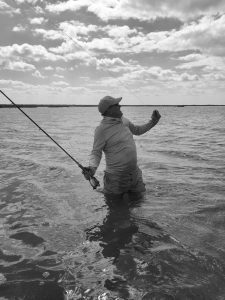 However if you stop stripping and just lift up the rod watch the fly swim towards you and bring it to the boat then you are in a position to just roll out the line and go into a backcast and deliver (roll cast pickup). This is called fishing to the bank or boat and is a general advice. Increases your chances of getting strikes and hones your roll casting abilities. Once hooked they put up a decent fight relative to their size and they will make a furious attempt at escape when close to the boat. 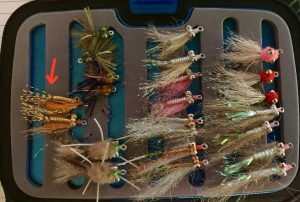 The Spanish will take all the usual Clousers and they will also take top water flies. When in the mood the fly is not important. 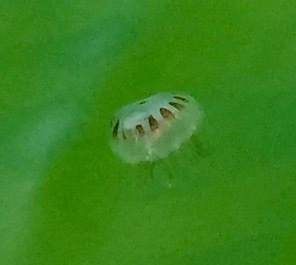 This one took a red Crease Fly after having followed subsurface flies repeatedly. So it pays to mix things up. If subsurface does not work try a topwater fly. It does not matter which fly you use to not catch fish. If I can use a topwater fly it is always my choice cause the takes are just so magnificent to witness. The Spanish are currently here and I have to go out and chase them because they will disappear when the temperature in the bays decreases. When they are gone I will absolutely not think that I chased them too much and I will miss them. 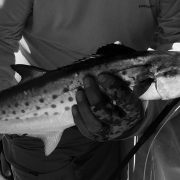 It is a consolation that I can then turn to False Albacore, Pompano, Spotted Seatrout, Redfish or Bluefish. So little time! https://everyjonahhasawhale.com/wp-content/uploads/2016/10/IMG_3197.jpg 1021 2405 Jonas Magnusson https://everyjonahhasawhale.com/wp-content/uploads/2019/03/FFI_9846_Logo®_Casting_Instructor_CMYK-600x476.jpg Jonas Magnusson2016-11-04 19:46:572017-05-03 13:32:15Hola Spanish - "pez malo"